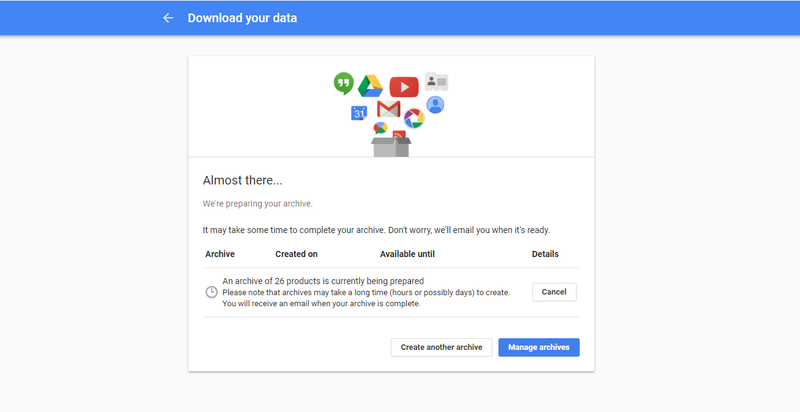 Downloading the data Google has stored is pretty simple. Let’s see how to do it. The first thing you need to do once you are on the Takeout page is to select the data you want to include in your archive. 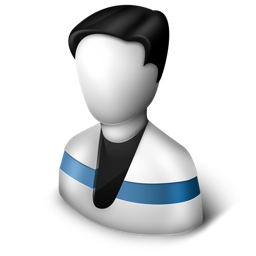 You will see Google Plus, Bookmarks, Chrome, Mail, YouTube and more. Select the data you want. There is also a button at the top of the list that allows you to Select none/Select all. Once you are done, click Next at the bottom of the page. File type. You can choose between .zip, .tgz, and .tbz. Next is to select archive size. The default size is 2GB, but you can choose what you like. Other options are 1GB, 4GB, 10GB, 50 GB. Choose the archive size having the quality and speed of your internet connection in mind. Finally, it comes the delivery method. You can choose between email, Drive, Dropbox, and OneDrive. When you are done, click Create archive at the bottom of the page. You will see a message that your archive is being prepared. After some period of time, you will be able to download your archive. For instance, i have selected the email as the delivery method. If you do the same, you will get an email “Google Download Your Data”, open it, and click Download archive. Thats it. 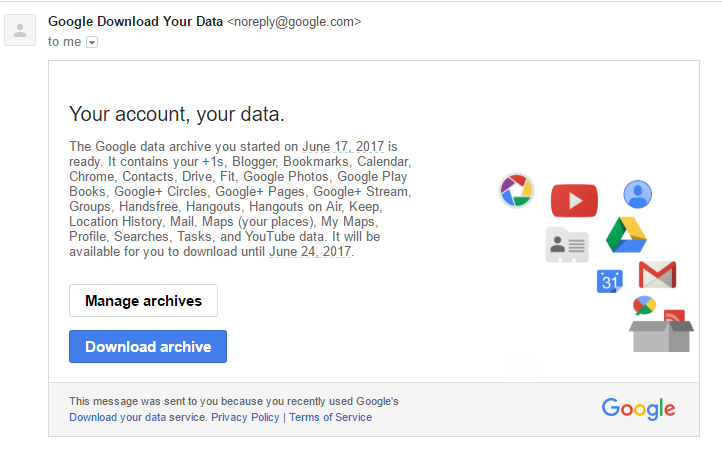 This is how you can easily download your Google data. It does not require too much effort, so if you want to do it, just follow the above-mentioned steps.